The Littlest Inventor is a children's picture book which tells a story about adjusting to sensory difficulties with some very sensible "inventions". These days, I'm finding myself reading a lot of really thick textbooks on the subject of autism and sensory processing disorder. As a children's book with limited text and some gorgeous illustrations, this was an absolute breeze to read. At around 30 pages with one or two lines of rhyming text every couple of pages, it's the perfect size for a bedtime story or to read in the classroom. The story is about a boy who goes shopping with his parents and experiences a sensory overload. The senses covered include sight, flickering lights, sounds in the form of chatter and smell. The ordeal in the shopping centre leads to a meltdown. When the boy gets home after the experience, he heads up to his bedroom to "invent" his way out of the problem. His inventions deal with the sensory problems and also provide him with sensory stimulation options including a weighted vest and chew toy. Danielle Ragogna’s illustrations are great and recall the style of my favourite children's book artist (Raymond Briggs). They're bright and colourful, simple but full of interesting details. 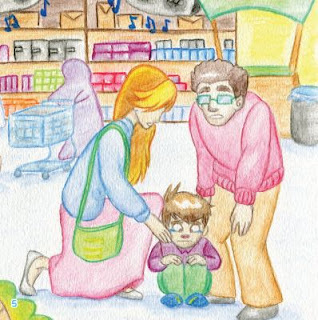 I love the way the littlest inventor and his parents are fully drawn but the other people (that he doesn't know) are drawn as sketchy blue or purple blobs. It really gives you the little inventor’s perspective. If you have a young child with sensory issues, (or if you have an older child whose issues you need to explain to your younger children) this is a great book to get. If you have a elementary school or preschool library to stock, then this book belongs there. The Littlest Inventor is a great practical book with twin messages of "acceptance" and the will to overcome difficulties. You may well find that the littlest inventor inspires you or your children to come up with similar inventions -- and that's a great thing. 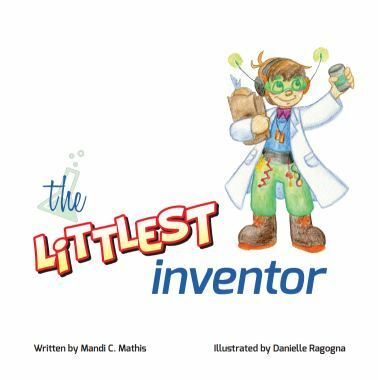 The Littlest Inventor by Mandi C Mathis (Illustrated by Danielle Ragogna) is available in paperback from Amazon. You can also visit Mandi's website here for more purchasing options. Honesty clause; I was provided with an eBook version of this book free of charge for review purposes.